Folk music that tackles some stirring source material that should not be forgotten. There is a roving central passion that brings both a delightful sense of joy and personal isolation to the works within. The album dwells very much in the topic it is exploring. The year 2016 will be seen as a year of upheaval and huge changes in the political sphere of these isles with the EU referendum. Whichever way people of the nation voted and what the impacts (positive and negative) of this choice are, we can say it was that, a choice. 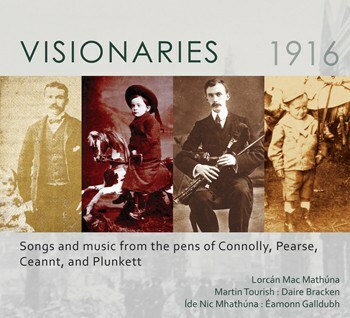 After this event but before the new year the album, “Visionaries 1916” was released (October) which marked the 100 year anniversary of a huge event in history much more turbulent and antagonistic than the current age, and with an exceedingly difficult choices individuals of Ireland were making in the face of English rule. In 1916 there was the “Easter Rising” in Ireland as revolutionaries seized a number of areas in Dublin city in an attempt to establish an independent Irish Republic away from England, as was said, “England’s difficulty is Ireland’s opportunity”. Many lives were lost during this time, innocent individuals got caught in this major event of street fighting, artillery fire and an estimate of 485 people lost their lives (with over a half being civilians). On top of this, independence did not come straight away and it was not immediately a positive outcome; it did however help crystallise an Irish identity that would lead to Independence further down the road. This album by Lorcán Mac Mathúna (voice) includes Íde Nic Mhathúna (voice), Martin Tourish (accordion), Daire Bracken (fiddle, guitar), Eamonn Galdubh (uillean pipes, saxophone, flute, bodhrán), and Elaine O’Dea (spoken word) works through the songs and poems of influential thinkers Plunkett, Pearse, Connolly, Mac Diarmada, Ceannt, Clare and McDonagh, with an emphasis on Plunkett and Connolly. 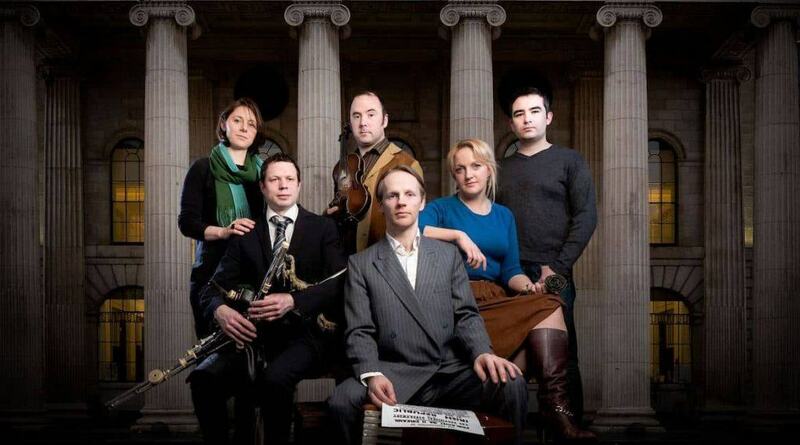 Arts Council Ireland have provided some funding for an interesting album concept indeed. The album design is remembrance through and through. There are photographs of the revolutionaries with their considering eyes, with hope and a spark of better things to come. In respect to the package design and case, the contents match the subject matter enormously. It is full of poems, lyrics and explanations of the circumstances at the time, poets are included and speak their piece too and there is quite a lot here for someone coming to this time and place in the world through new eyes. This means that it effectively puts a good deal of respect into history and the complexities of characters within it at the expense of a more stylised and streamlined presentation. It could not have been any other way, or should be, it aims for the folk fan with a patience for learning and reading and evaluating and captures all sides. By explaining the “awkwardness” of one revolutionary (Pearse), and the “unlucky in love” Plunkett we see a moral and character complexity that is quintessential for folk music of this kind; it also gives us a good insight into the poetic inspirations of the authors and the songs giving contextual information for this unfamiliar with the revolutionaries. But what of the music itself? There are some interesting tracks here. The first track, “Daybreak” bursts into your senses and refuses to be contained. A surprising clash of saxophone, fiddle, and accordion it conjures a breaking of thought like harsh water scattering of waterfall rocks. Plunkett’s poem fortifies in the chest, the yearning in the singing voice is expertly matched by the chasing fiddle (Daire Bracken) and instrument of sultry nights, the saxophone (Eamonn Galldubh) that all meld into a powerful and emotive entrance. It conjures images of a deep thinker, a darkly, silent man who reads with full knowledge of conflict to come. Irresistible and charming, the track reflects Plunkett’s sensitive nature, it pierces the still emotional depths of a man wanting both a new freedom and identity as well as more luck in love, “for you have flung a brand, and fixed a spark. Deep in the stone, of your immortal fire.” Track five,”White Dove of the Wild” brings a wider more sweeping and less pacey interpretation of Plunkett. 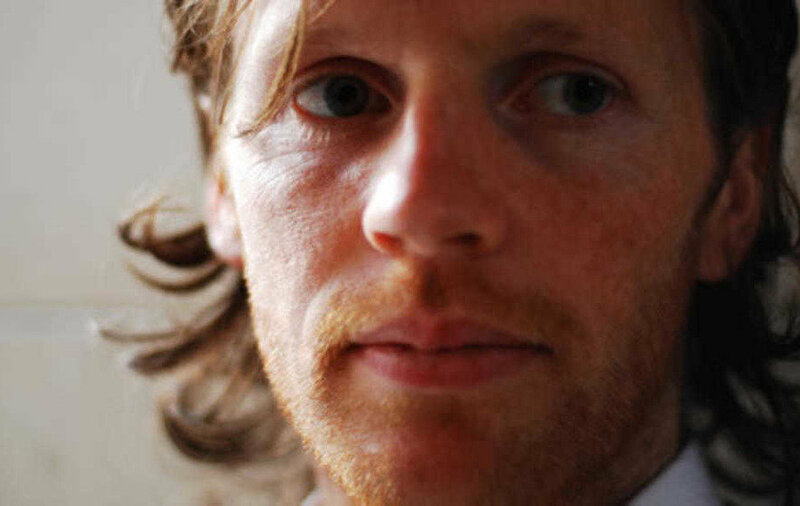 The rhythm in your minds eye takes a backseat as Lorcan Mac Mathuna finds and accentuates an almost cosmic nature to the poem, lingering over the words but allowing a slower, more pronounced soundscape to form from a solemn voice and accordion. “Daybreak” is catharsis through honest work and the outdoors, “White Dove of the Wild” is the firing of neurons as the narrative of a recently read book begins to rearrange in your dreams. Both stirring, both effective. For track four, one of the James Connolly’s poems “We Only want the Earth” is put into song. The composition offers persuasiveness and persistence in a voice that feels very much that it speaks from a group soul which is both jolly and spirited. Both singers (Lorcan Mac Mathuna and Ide Nic Mhathuna) project huge emotion that conveys yet with some added deft flute work here (Eamoon Galldubh). The instrumentation and yearning vocals bring a bright vibrancy to this song of the people, the “mirth” of the poem is emphasised and projected outward despite the serious desire and wish. The energy within the Irish tradition flows through this track freely and is much a character reference for the people and history of this place as any. The albums inclusion of An Dord Feinne (Óró sé do bheatha abhaile) is essential for a work such as this with it being the song of rebellion. The arrangement and singing gives it a rather militant “in the field” feel particularly compared to other interpretations (i.e. Sinead O’Connor and The Dubliners), it works really well and shines like the heart of a poet under a grimy, sodden exterior; a thinking man becoming a man of action through necessity. This is not an isolated effect on the album. An aspect of many of the performances here is the feeling that they are putting flesh to these darker quieter moments by adding a realism that permeates through your speakers. In track 9, Fornocht do Chonac (from Pearce) the song could be the laments of men in prison awaiting their executions, mulling their actions over and considering their love for their country. Under a sound cracking fiddle, a sad flute interlude, and incarcerating accordion (Martin Tourish) it reaches some quieter, darker moments that nevertheless glow with a black shine if inevitability. Likewise the final track, “Lament for Thomas McDonagh” is a beautifully sung poem that feels like the still ocean, awash with a piercing moonlight across the water’s surface. There is foreboding as Lorcan describes when, “the Dark Cow leaves the moor”, his voice is a tight rope, a straining oar, and all-in-all a great solo effort. A lively arrangement with a breath of life on to old history, it clearly is infused with reverence. It’s delivery is traditional, heartfelt and rich with some delightful counterpoints of vocal harmonies. It manages to show and transmit the hope of these revolutionaries through soundwaves, through a tight collection of instruments that are all undoubtedly working to this end. It would be wrong to suggest that it is always an easy and jaunty listen, revolution is often bloody. Mac Mathuna has managed here to keep the focus on the glimmers of optimism in the writers, despite the difficulty of this time. Fans of history, politics and poetical should give this album of Irish identity a good listen and it was a very characterful addition to 2016’s folk roster indeed. Check out the video below see if you would like to give the album a go! You can order the album here on their website, where there is also details of their remaining tour dates in Wexford, Dundalk, Dublin and Cork.